Summit Daily/Caddie NathState Rep. Millie Hamner talks education financing during a meeting yesterday in Summit County. She's carrying legislation that would make significant changes to Colorado's School Finance Act. 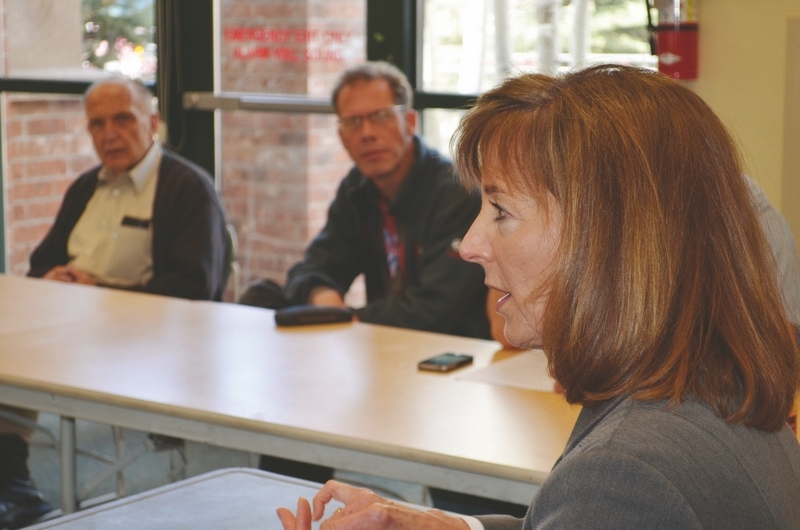 SILVERTHORNE – State Rep. Millie Hamner (D-Dillon) was in Summit County Saturday to talk about Colorado’s education shortfalls and the bill Hamner says she hopes will help fix the state’s broken finance system. Senate Bill 213 will be introduced to the state House of Representatives Monday proposing the first sweeping changes to Colorado’s School Finance Act in decades and a ballot question asking voters to approve a roughly $1 billion tax increase to fund education. Hamner called the bill the most significant piece of legislation she has carried in her career. A handful of people involved in a variety of school and social issues attended the Saturday morning meeting at the Silverthorne library. It was the most recent in a series of education-focused town halls Hamner has hosted around the district ahead of the launch of SB 213 in the House next week. The meeting also included a presentation by Casey Shea, outreach director for GreatEducation Colorado, who presented the Year of the Student effort to return focus to improving and reinvesting in Colorado’s schools after years of recession-induced reductions in education spending. The Year of the Student is a collaborative effort of several thousand Coloradans from various sectors to coax lawmakers and taxpayers to reprioritize education. Colorado currently ranks in the bottom 20 percent of states in the country in student-teacher ratios, technology and teacher salaries, Shea said. The state has the second largest achievement gap between students who receive free and reduced-cost lunch and those who do not. The state’s per-pupil funding has fallen from slightly above the national average in the late 1980s to well below it following the approval of the Taxpayer’s Bill of Rights and other funding-related measures. Hamner’s school finance reform bill takes aim at the current funding system, which allocates state money to each district based district size, at-risk factors and area cost of living and leans heavily on local jurisdictions to cover funding shortfalls. Hamner says her bill would reorganize that model for the 21st century, ensuring greater transparency in education funding (using a website allowing parents and taxpayers to track every dollar that goes into education) distributing funding more equally, giving individual principals more budget control invest in early childhood education and providing money to districts planning to extend school years or school days to close the “time gap” between Colorado and other states or countries. Even if SB 213 passes the state House and wins the governor’s approval, it can’t go into effect unless voters approve a statewide income tax increase in November to fund the proposal. If they do, the Summit School District could receive new resources for full day kindergarten, preschool for all at-risk 3 and 4-year-olds and per-pupil funding could increase from $6,863 to $7,392. But the bill is controversial, Hamner conceded at Saturday’s meeting. She said she is receiving an email from someone opposing the measure every minute. Those who attended the meeting also discussed the progress of the Lobato case – a suit parents and school districts across Colorado are bringing against the state of Colorado, the governor and the Board of Education alleging the current school finance system violates the state constitution – and the need for vocational training in Colorado high schools.